Bee's Cooking and Chromosomes and Anita's reply reminded me of a much repeated exchange whenever we are going out to shop for essentials. He: Why do I always have to drive? Me: Why do I always have to cook? Me: OK but then you cook today. Medha: Daddy! Please! Please drive! It's not a mistake that all four - yes, only four - ingredients in Ammini's Paal Paayasam are white. How does this fit in with food and the satiation of discerning taste buds, one might wonder! Well, I have a theory that there there are certain foods in Indian cuisine that are deliberately slow-cooked, and it is not just for the enhanced flavor. These foods require a fair amount of interaction from the cook, unlike foods cooked in the slow-cooker. Think back to the days when families were not nuclear, when the stoves in the kitchen were lit well before dawn, in preparation for the first meal of the day. There may have been a cook, or there may have been several women who cooked together. Grandmother, mother, daughter-in-law, unmarried daughter, niece, sister-in-law and so on. Every woman needed a periodic break, pun intended, and that is how the isolation during the monthly menses can be explained away. But what about the rest of the month? I think that in order to give the women a break from the fast and exhausting pace of cooking and serving meals for a large family, they were sometimes given a chance to sit by and stir the same pot and perhaps get a chance to reflect on their own needs. Maybe find some inspiration in the continuous swirls and bubbles in the pot they sat by. I could be totally wrong, of course. Maybe I need to call it a hypothesis, and not a theory! But I found this little piece of nirvana when I made Ammini's Paal Paayasam. I let go of time. I stirred and stirred. I enjoyed the constant motion in the food and my chosen immobility. The smell of milk as it neared boiling point has never seemed so divine. Add to it the incredible aroma of rice as it cooks. The sloshing white liquid had me enthralled. At the end of it all, I was incredibly relaxed, very rejuvenated and I also had a creamy silken delight to serve with dinner. Of course, another reason for the all-white ingredients could a symbolic toast to purity since it is a dish offered to the Gods at the temple. 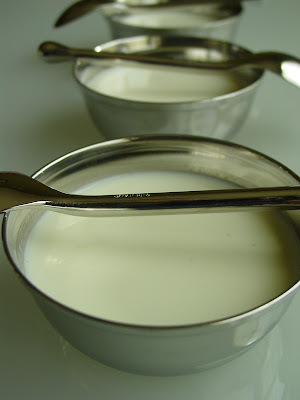 Paal paayasam is believed to be the favorite dessert of Lord Krishna. On Janmashtami, Lord Krishna's birthday, paal paayasam is offered at all Krishna temples across the country. Perhaps this was not the right dish to make at a cook together and it would have been preferable if I had cooked it in advance, with the desserts. It took up one whole burner for the entire duration of the cook together. So I was very lucky that Lee brought her induction burner and its special pot and we were able to include it anyway. My friend Charlotte stirred away and did not complain even once. Given how active the kitchen was and how involved she was with the rest of the dishes, I don't think she quite got a piece of the meditation I was talking about earlier. But the circumstances were different so my hypothesis still holds. According to me, anyway! 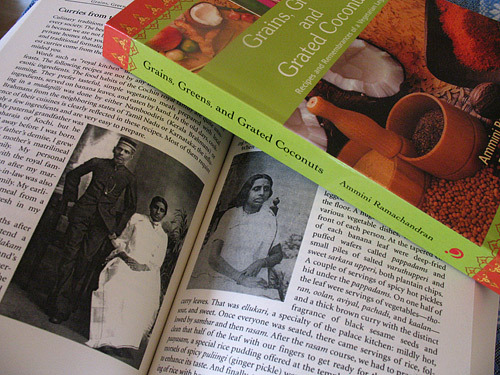 From Ammini Ramachandran's Grains, Greens and Grated Coconuts . Much is made of rice in Kerala, and in its best incarnation, it becomes amazingly delicate and creamy, nestled in a pool of slowly simmered, condensed, and sweetened milk. Traditionally, paayasam is cooked over a slow-burning wood fire for several hours, so that the milk cooks down and thickens. Once the sugar is added, the rice stops cooking, and the long, slow simmer will not make it into a soggy lump. Instead, the milk will condense and develop a reddish hue. Ammini's recipe is a simpler and quicker version of the traditional slow-cooked version. Wash and rinse the rice in several changes of water until the water runs clear. Do not drain the water completely just yet. 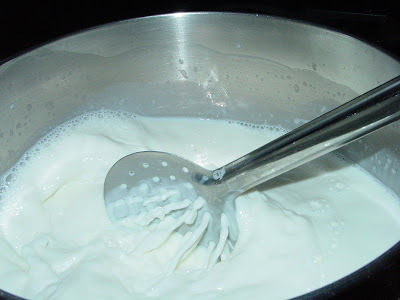 Heat the milk in a large pot or saucepan over medium heat. Do not leave it unattended as it can get scorched. I lowered the heat to medium-low and stirred every so often. When it comes to a boil - about an hour or so - drain the water from the rice and add only the rice to the pot. 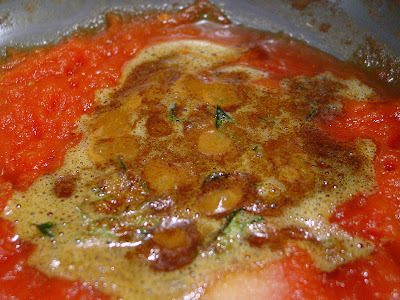 Lower the heat further, and cook stirring continually to prevent scorching. It will take between 15 to 20 minutes for the rice to cook. To test if the rice is ready, try to mash some rice grains with a spoon after taking them out into a katori. It is done if it is very soft to touch and gives way easily. Cook for another five to ten minutes, if necessary. Remember that the rice will stop cooking once you add sugar! Stir in the sugar, and cook for another ten to twelve minutes. 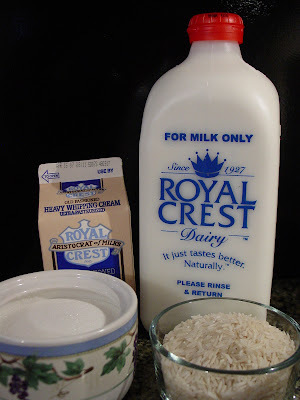 Pour in the heavy cream, and bring it to a boil. Reduce the heat, and simmer for twenty-five to thirty minutes, stirring occasionally. Remove the pan from the stove, and keep it covered to prevent the milk from forming a skin. Served either warm or cold but preferably along with the meal and not after the meal. Unless you are sure you like paal paayasam very sweet, add 1 cup of sugar, stir till it is dissolved and do a taste test. Add more sugar, 1/4 cup at a time until you are sure it is at the level of sweetness you like. For us, 1 cup of sugar was not quite enough and 1 and 1/2 cups were too sweet. A pint of heavy cream is a little over 2 cups, so you can just go ahead and add the entire pint. Why were we stirring so much? The pots we were cooking in seemed likely to scorch the milk if it was not stirred. Unless you have cooked down milk before and are sure that it will not get scorched, keep stirring the milk as you bring it to a boil. Resist the urge to add cardamom powder or to sprinkle cinnamom powder. Also resist the urge to add raisins or cashew nuts. Trust me, this paal paayasam simply does not need anything besides the four pure white ingredients. Paal paayasam, made the traditional way, has a gorgeous pinkish hue. The sugars caramelize as it cooks slowly for a longer period of time. 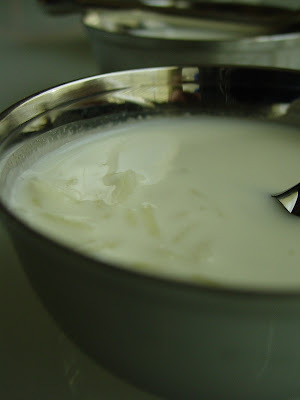 As Priya of Akshayapaatram mentioned in her comments to this post, paal paayasam can be made using condensed milk instead of heavy cream and sugar. And, you can get that coveted pinkish color within a much shorter cooking time! Ammini suggests that you first cook the rice in the whole milk, then pour a can of condensed milk in a thin stream as you stir continuously. Keep stirring until the condensed milk is properly incorporated. Simmer for another fifteen minutes, and add more sugar if you like it sweeter. I am reluctant to call this rice pudding because it is in a class of its own. No rice pudding can touch this! And that is from someone who does not care much for Indian sweets, especially our Maharashtrian version of Paal Paayasam, also called kheer. It is certainly not ye olde rice pudding, the western version for which multiple recipes abound. The quality of ingredients always makes a great difference in the end product; the rice used for paayasam is no different. Back home, hand-pounded unakkalari, the aristocrat of rice varieties, is used for making paayasam. But like all true aristocrats, it is scarce, and I believe it is never exported abroad. It has a delicate flavor and a consistency that has just the right cling, and it cooks into a perfect paayasam. The clinging consistency of the paayasam depends on the starchiness of the rice. The rice should possess just enough starch to cling in cooking, but not too much to become gummy. The authentic pot for cooking paayasam is the uruli, a heavy and shallow bell-metal pan with a curved interior. A heavy pot that transmits consistent, even heat is a perfect substitute. Do not use parboiled rice for paayasam; those grains always stay separate. In the absence of the real stuff, medium-grain or long-grain white rice is the preferred substitute. We may not have wood fires in our kitchens but I would urge you to take time off from your daily chores and sit awhile by a pot of milk and stir. Put the phone off the hook, turn off your cellphone, take off that headset, turn off that computer, let the light stream into your kitchen and let go! Okra. Bhendi. Bhindi. 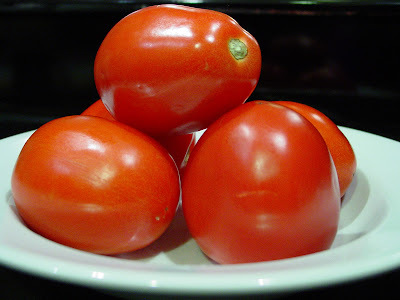 A much loved vegetable in India but looked upon with distaste in the US. I could not get just why for the longest time. A friend, who was also at the cook together I hosted in December, had once remarked that okra was one vegetable that she detested. I remember offering her some bhendichi bhaji when she had dropped by and we were in the middle of a late dinner. She was thrilled with the roti but I could see her body stiffen and her mind freeze when she put a piece of bhendi in her mouth. She chewed on it slowly, relaxed visibly and said, "That was the best piece of okra I have ever had in my life!" She had only eaten slimy okra before. I had no idea that what I take for granted about okra, is apparently not the norm for many of my friends. Until I came across Marc's Okra without the slime! So before we move on, here's a quick primer on selecting and preparing okra. Choose young and tender okra that are smaller in size. If in doubt, try bending the tail end of the pod. It should snap readily and cleanly. Use this to get a feel for young okra and do it quickly. Don't practice on too many okra pods otherwise you will not be welcome at the grocer's again! Wash and dry each pod completely. 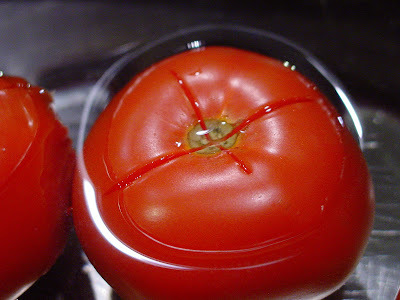 Use a dry cutting board and a dry knife. As the okra is chopped, you will see some mucilage collecting on the knife. Keep a paper towel handy and wipe the knife as often as possible. Cook the okra with slightly more oil than normal and on high heat. My theory is that high heat seals the outer edges preventing further oozing. Do not cover the pan while cooking as moisture undoes what you have worked hard to avoid. 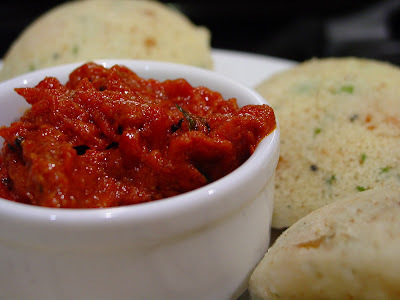 Because of years of negative conditioning towards okra, I was not very keen on featuring Okra Kichadi on the menu. Then I tried it. It took bhendi to a new level. Seriously! There was no way I was not sharing it with my friends and if I could dispel some myths about the slimy okra in the bargain, I figured this would be well worth it on all fronts! 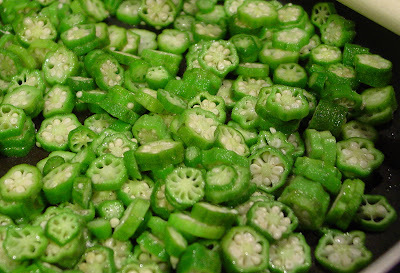 Okra, the quintessential ingredient in gumbo, has a tendency to become slimy when cooked. In this mildly spiced curry, diced okra is panfried before being added to the sauce, which prevents it from turning slimy. It is spiced mainly with mustard seeds. This curry delicately balances the heat of the sambar and spicy pickles that are typically served along with it. Heat 2-3 tbsp oil in a large saucepan. 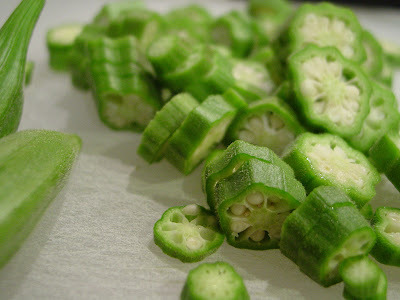 Add chopped okra and cook on medium-high until the okra is a slightly browned at the edges. Toss it about periodically so that it does not burn. Do not cover the saucepan. Typically, this takes about 10-15 minutes depending on high you are. In altitude, of course! 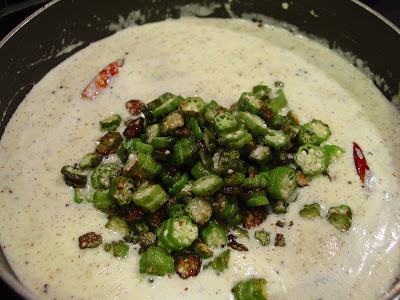 While the okra is cooking, blend the coconut, 1 tbsp mustard seeds, Thai green chillies and yogurt into a thick purée. When the okra is done, transfer it to a bowl and set aside. Do not cover. For those of you who are wondering...there were 32 pods in about 1 lb of okra. Yes, I counted them. He looked at the bowl and said: That's one pound worth? Only that much? I'm hoping it's finally registered why we need more than 10. Next, prepare the tempered oil for the seasoning. Add 1 tbsp oil to the saucepan and when hot, add mustard seeds. 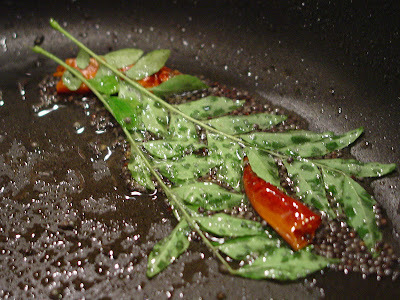 When the mustard seeds start popping, add the dried red chilli and curry leaves. Do not allow the red chilli to burn. Turn the heat down if necessary or take the saucepan off the stove. 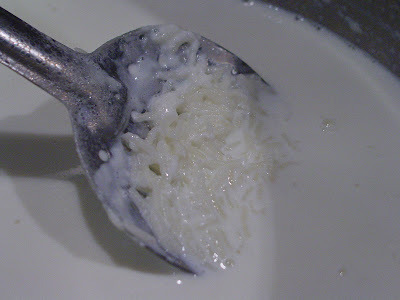 Pour the coconut-yogurt mixture into the saucepan and cook over low heat, stirring occasionally, until the sauce simmers. Gently stir in the okra. Cover and set aside for at least 10 minutes to allow the flavors to blend. 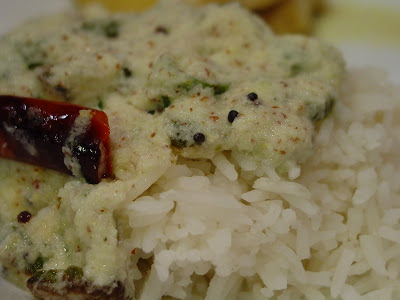 The okra kichadi is a sensual mix of flavors from few ingredients. It is so delectable that it is hard to tell that the saucepan it was cooked in was ever used at all. It's literally licked clean! Since I don't get good quality fresh coconut, I buy frozen coconut. The best I have had is the one that says "Product of Kerala". No prizes for guessing that! The last time I made this, I bought Colombian grated coconut that was naturally so sweet that it was hard to believe that no sugar was added to the product. 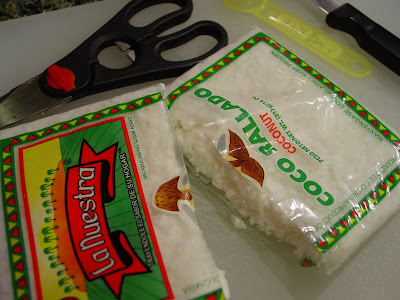 I thaw the coconut in the refrigerator and cut the packet in half using my kitchen shears. 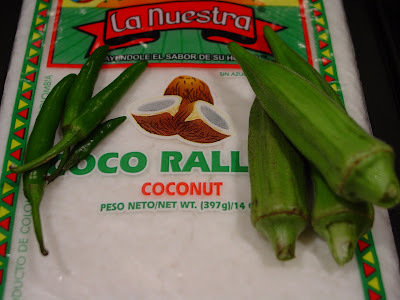 I use one half for curries like okra kichadi and save the other half for coconut chutney or fish curry. I generally use the second half within 1 day of thawing. 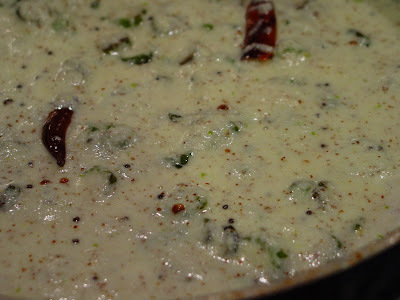 Ammini's recipe suggests blending the coconut with green chillies and mustard first, and then stirring in the yogurt. Since my blender groans while grinding coconut with little or no water, I add yogurt while blending. I use 2 cups of yogurt because we like the sauce to be a little runny and we like to smother and drown our rice in it. The okra can get slightly slimy when covered towards the end of the process. I have found that if I cook it till it is crispier and more brown, the return of the slime can be averted. I like to add 1 tsp of urad dal to the tempered oil. 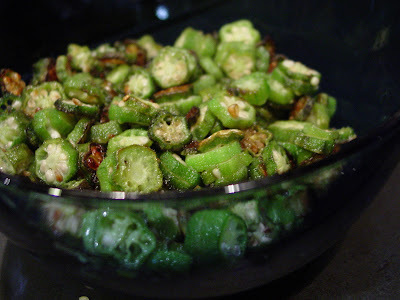 Medha loves these crunchies in her okra kichadi. Whether it is a wedding or a religious holiday or a birthday, the recipes in this section are the standard fare at any sadya (feast).At a traditional sadya, there are no fancy table settings or beautiful vases of fresh-cut flowers, and there is no particular main course. The perfection of the dishes is more important than the presentation itself. They come just as they are, served on a large banana leaf spread on a clean floor or a simple table, with rice in the center accompanied by several vegetable dishes, both wet and dry, and several different accompaniments. And as you begin to relish the meal, so many different flavors are blended on the palate that each bite tastes different and better than the one before. Food's greatest glory is in its infinite variety of textures and flavors. She draws you into her childhood memories. She walks you into her world of culture and traditions. She leads you deeper into the history of her land and her people. And, she regales you with vegetarian recipes from the royal family of Kochi and from the people of the bountiful Indian state of Kerala. 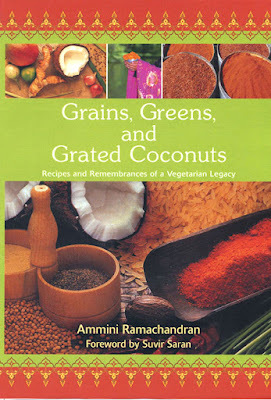 She is Ammini Ramachandran and she does this through her just released book, Grains, Greens and Grated Coconuts . The title itself evokes visuals of lush landscapes, rich produce and delightful recipes! And the book does not disappoint. Morning begins before sunrise in India. I still remember, from my childhood in lush, tropical Kerala in southwestern India, the sounds of a large joint-family household coming alive before daybreak. I could hear the clatter of brass pots and copper pans being washed and the rhythmic creak of the granite grinding stone pureeing coconut and green chilies for fresh chutney. Temple bells rang in the distance, announcing predawn prayers. The fragrance from the wood-burning stoves and the aroma of fresh decoction coffee permeated the entire house. Soon, the sizzle of dosa batter falling on the hot griddle would entice everyone to get up and get ready for breakfast. Wouldn't you want to read more? I sure did. And I am still finding new gems in this just released cookbook, for example, Ammini's thoughts that resonate with healthy, environmentally sound food. 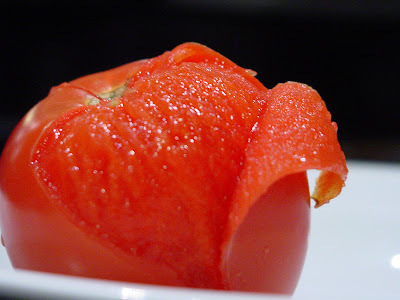 The two most important aspects of this vegetarian cooking are seasonality and flexibility. This cuisine is all about creating the tastiest and most satisfying dishes from a few fresh, seasonally available ingredients. It's the perfect kind of book to curl up with and experience Kerala cooking at its best. A little bit of a paradox, that! But yes, it's entirely possible! Back home, we are taught to cultivate a sense of smell and color, and we try to accomplish perfection in cooking through exploration. Almost every ingredient is measured only by hand—a handful, a little, a pinch, and so on. Cooking is an expression of the cook’s personal tastes and preferences. The joy of it is in experimenting. The delight in cooking is not necessarily derived from the end product alone, but from the endless possibilities available for flavoring a dish. I urge you to use these recipes for ideas and suggestions. Improvise, but never let a cookbook order you around. If eating by the season did not strike a chord with you, surely this last excerpt must! This is no ordinary cookbook. The recipes have been adapted for modern kitchens, with suggestions for substitutions and variations. There is a comprehensive glossary that provides the origins and history of each grain and spice. There are a mind-boggling number of recipes, 175 to be precise! There is an amazing section on the spice trade in the Indian Ocean and Kerala's cultural history. It's no surprise then that Grains, Greens and Grated Coconuts was selected to be Publisher's Choice! Ammini is the grand-daughter of the Maharaja of Kochi and was brought up in a large joint family of matrilineal Nayars. She has delved deep into her past and her roots over the last seven years to put together this masterpiece. A natural at culinary arts, it was a surprise to learn that Ammini had made her career in finance before this. She is an accomplished writer, having contributed to several food journals. I first found her on Pepper Trail, her web site where she chronicles the history, traditions and culture of Kerala. I was therefore thrilled to find that she was an active member of the food forums that I frequented. Never flippant, always cordial and extremely forthcoming, interactions with Ammini have been both enjoyable as well as educational. On December 3 last year, I invited four of my friends for a cook together. We couldn't meet over Thanksgiving so this was the next best time, before everyone became busy with the upcoming holidays. I was looking for recipes for this rather ambitious, never-before-attempted-by-me event and I wasn't quite sure what kind of a menu to put together. I was thrilled and very honored when Ammini agreed to let me use some of her recipes for this cook together. The menu was entirely vegetarian and was met with hearty approval by all my friends. I left the door open for a meat dish and sure enough, Hyderabadi Marag was added to the list by popular demand. 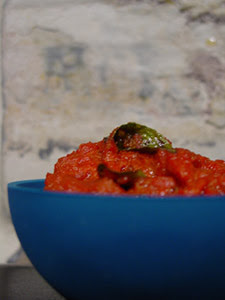 Ammini's Fresh Tomato Chutney was also on the menu but we dropped it as we had too much going all at the same time! (I will be sharing the recipe as I've made it several times since.) Think about it: 5 women, one a little sick but who wouldn't miss this event, bumping into each other in my little kitchen! We were cutting, chopping, stirring, talking, laughing, tasting...oh! it was so much fun. A little disorganized, but a lot of fun! It was a good thing that I made the desserts the previous day! I made Gajjar halwa and SH's delectable Coconut Burfi. Chai, red wine, sparkling cider and beer flowed freely. We started cooking at about 3pm and dinner was finally served at almost 7pm - over an hour late! There were 10 of us for dinner that night as the men were invited to join us for the feast. And a feast, it was! It wouldn't have been possible to share so much of India with my friends if it hadn't been for Ammini's help and guidance. Stay tuned for a peek at the recipes that Ammini so graciously shared with me, marked with ** in the menu. And while you're waiting, go check out her web site, read an excerpt from the introduction to the book, let your eyes be pleasantly surprised by the fantastic contents and, if you're convinced, order Grains, Greens and Grated Coconuts . If you need more cajoling, wait a bit, see the recipes come alive on Indian Food Rocks and I am sure you will be convinced that this book is a must-have. Remember that there are very few books on vegetarian Kerala cuisine and even fewer that are well-written. This is a very special cookbook that I hope to pass on to my daughter, especially since she is already enjoying the results so much! Update: Whoops! Comments were not enabled for this post earlier! That was not by design but a mistake. They are now enabled again! Thanks, Anita! Except that all of us really prefer potatoes. No kidding! We will forego the delicious cold treat for another helping of that terrific tuber. I have been enchanted by Gini's Oven roasted potatoes with Indian spices ever since she posted them over a year ago, with perfectly broiled lamb chops. It was only this January that I actually did something about it besides periodically going to Gini's blog to salivate over the pictures! 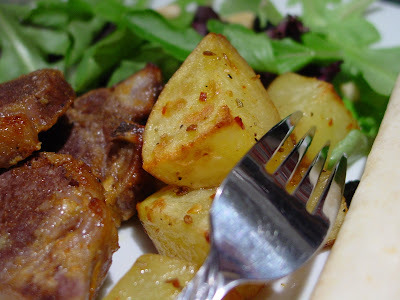 Broiled lamb chops and roasted potatoes soon became a mid-week favorite. Instead of indulging in some touch-and-feel-and-put-it-back-on-the-shelf therapy at Kohl's, I started going to Sam's Club to pick up a tray of delicious New Zealand lamb chops while Medha was at piano lessons. We'd hurry home and by the time she was done with her shower (read: finished all the hot water), a delicious meal would be ready for the two of us, with plenty leftover for the next day. Coarsely pound all the spices using your mortar-pestle. Sprinkle the spices and salt over the chopped potatoes and toss till they are covered evenly. Drizzle the olive oil over the spiced potatoes and toss again. If these are being cooked as a side for broiled lamb chops, then put these in the oven with the lamb. When you turn the lamb over, toss the potatoes, too. Um...otherwise broil these and pull them out after 10 minutes or so to toss them about and return to broil till done - another 10 minutes or so. It really depends on the potatoes so you will have to wing it as far as the total time is concerned. I served these to-die-for potatoes with lamb chops, a refreshing salad and rumali rotis that I found in the freezer section at my Indian grocer. What I loved about this meal was that it was quick, with minimal clean-up. It was also the perfect meal to satisfy those mid-week cravings and chase away the winter blues. I'm sending this over to the ever resourceful and entertaining Vaishali as my very first entry ever in Indira's Jihva for Ingredients. The ingredient in the spotlight is Potato! Yahoo! 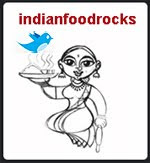 India stole content from Malayalam food bloggers to create content on the fly for their new Malayalam portal. They stole images from non-Malayalam bloggers, too. Shame! Worse still, they shirked any responsibility saying they were misled by their subcontractor, Webdunia. More shame! To both! They did it once. They need to be stopped before they do it again on the other regional language portals they are bound to launch in India. They - Yahoo! 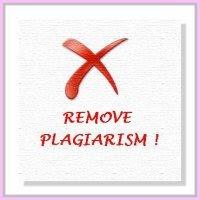 - need to acknowledge intellectual property and copyrights of those whose contents they plagiarized. This holds for every company seeking to launch a portal in India and the world over. Our content is not yours for the taking. Thank you, Sandeepa, for the image!